The only reason to invest in HubSpot, or online marketing in general, is to generate more revenue. But, because HubSpot is such a broad platform enabling everything from blogging and social publishing to landing pages and deal tracking, it’s easy to lose track of that purpose. To stay true to the plan, you must execute the marketing activities that will maximize sales achievement. Use the revenue calculator and the dashboard below to ensure you’re doing just that. The calculator will help you, well, calculate your marketing goals. 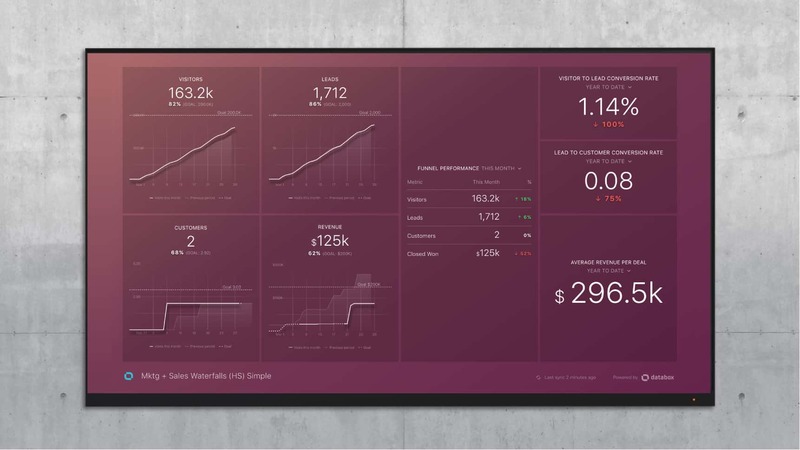 The dashboard will allow you to track, improve and forecast your key marketing and sales metrics. Follow the steps below to implement a fool-proof, quota-crushing, marketing plan. When we began selling HubSpot back in the day, I created what was later dubbed “The Inbound Marketing Calculator” to help prospective customers calculate their marketing targets based on their revenue goal. If you’re just getting started with a metrics-driven marketing approach, use my simple, original version. Your visitor to lead and lead to customer conversion rates. If you’re already using HubSpot and you’ve defined MQL and SQL definitions, you might want to use a more advanced calculator. Many HubSpot partners have created ones that allow some additional inputs. For example, Impulse Creative’s is a web-based version that calculates the traffic you need based on your lead to MQL, MQL to SQL and SQL to Customer conversion rates. New Breed Marketing’s calculator requires the same inputs as Impulse Creative’s, but is a downloadable excel version and also allows you to enter your SQL to Opportunity Conversion rate, if you’ve defined SQLs differently than sales opportunities. Use either my or New Breed’s excel versions to determine how much you can reduce your lead and traffic targets by improving your conversion rates. Regardless of which version you use, the calculator will tell you how many leads and how much traffic you need to achieve your revenue goals given your current conversion rates. I’ve designed the dashboard below to monitor both your conversion rates and your progress to your traffic and lead goals. Once you set the goal inside Databox, you will be able to monitor your progress to that monthly goal any hour on any day of the month. Notice the goal line on the graph below as well as the % to goal number on the four charts on the left in the dashboard above. If you need to quickly close the gap between your current performance and goals, you might want to focus on improving your conversion rates. adding calls to action to popular pages of your site. For HubSpot customers, here’s a dashboard that lets you monitor your landing page performance. Your landing page conversion rate will probably be the most important lever in improving your overall visitor to lead conversion rate. or improving your sales process in any number of ways. Don’t stop trying to improve your conversion rates. Everything you do to improve conversion rates will not only have an immediate impact on revenue, but a lasting one. Create a backlog of ideas, hypothesize how they’ll impact your funnel and work down your list each month, every month. Once you have your conversion engine working well, it’s time to put gas in the tank and press the accelerator. To grow website traffic, increase your blogging output, do more guest blogging, improve your SEO strategy, double down on your social media activity or just spend more money on Facebook ads or google Adwords. Consider committing additional resources to improving both your conversion rates and increasing your traffic concurrently. Both will produce more and more qualified leads every month going forward. Also, if you do your blogging well, your website traffic growth should accelerate in a non-linear way. Why? Each blog post that achieves first page ranking in search engines or gets inbound links from pages that do, will continue to produce traffic into the future. In effect, when you start a new month, you’ll be able to count on some traffic from previously published articles. If you really stick with consistent, high volume publishing over months and years, you can count on exponential traffic growth since sites with more content and more inbound links get exponentially more traffic than others. Since blogging is so important to growing traffic, you might even want to set a goal for the number of posts you need to write or the amount of blog post views you need as part of your visitors goal. You can use this dashboard to track your progress towards that. The inbound marketing calculator is a static document. Periodically, you should revisit the progress you’ve made and revise your targets. If your marketing doesn’t perform as well as you had hoped, you might need to revise your targets to be more realistic or you might need to increase future targets to make up for past shortfalls. I recommend reviewing your conversion rates once a month. Update your revenue target when necessary and update your conversion rates if they’ve changed. If your conversion rates or average deal size went down, you should update your model and your traffic and lead targets inside the Goals app in Databox. Otherwise, you’ll come up short. The first Databox dashboard above makes this easy by showing all of the calculator’s inputs in one view. You can also use it to make sure your conversion rates aren’t slipping. While the default view of the visitor to lead, lead to customer and average sales price data blocks are set to the “Year to Date” time interval, just click the block to see month to date or last month, like the animated gif below shows. By using the calculator and this dashboard, you can stay on top of your goals daily. The last thing you want is to come up short at the end of the month with no time to recover. On the other hand, if you monitor your dashboards daily and see things going sideways in the middle of the month, you can adapt your plan. For example, let’s say you’ve put all your focus on blogging and it hasn’t grown traffic at the rate you predicted, you might want to shift some money into ads to make sure you hit your lead target this month. Or as another example, let’s say the landing page and offer you created was not producing a high enough conversion rate, you might need to promote an older one again that has performed better historically. Whatever you do, don’t wing it. Online marketing is predictable, measurable and improvable. By measuring your conversion rates and your throughput, calculating your goals, and monitoring you progress, there’s no reason why you can’t reliably beat your sales targets.